Please note that the content of this book primarily consists of articles available from Wikipedia or other free sources online.James Wren Taylor, better known as "Zack" (July 27, 1898 - September 19, 1974), was an American Major League Baseball catcher with the Brooklyn Robins, Boston Braves, New York Giants, Chicago Cubs, New York Yankees, and again with the Brooklyn Dodgers. The native of Yulee, Florida, joined the St. Louis Browns as a coach, and when Luke Sewell resigned as manager in 1946, Taylor finished out the season. After a disastrous 1947 campaign, Browns general manager Bill DeWitt re-hired him as manager. He lost 100 games in two of his five seasons as manager, and after the 1951 season, he was fired. 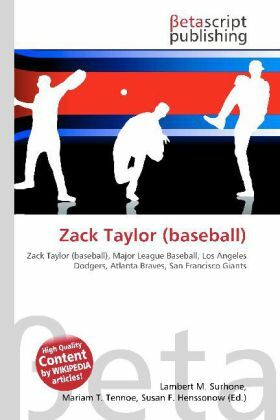 Taylor also coached for Brooklyn and the Pittsburgh Pirates, and remained active in baseball as a scout until his death in Orlando, Florida, in 1974.